Megan Wyatt is best referred to as a Strategic Interventionist and is a certified SI coaching and on-going student from the Robbins-Madanes Center for Strategic Intervention where she has chosen to enter into a third level training program which includes live feedback from Cloe Madanes who is a world-renowned therapist, innovator, and teacher of family and brief therapy. Cloe Madanes was a direct student of intervention master Milton Erickson and was one of the originators of the Strategic Approach, and she along with her husband, Jay Haley, helped build the foundations for strategic therapy and family therapy. Cloe has teamed up with Anthony Robbins, who is a recognized authority on the psychology of leadership, negotiations, organizational turnaround and peak performance, he has impacted the lives of more than 50 million people from over 100 nations. Together, they are creating an entirely new, cutting edge method for helping and supporting individuals in the challenges of life, to increase the quality of living and greater fulfillment. While this training is intended for Megan to take her coaching skills to the next level, her work is also influenced from other healing modalities, such as the work of Alexander Lowen and Somatic healing principles of Peter Levine. She feels, however, that the greatest resource is simply the school of life, being a real, vulnerable, and flawed person struggling everyday just like everyone else to have a life lived for the sake of Allah. The greatest lessons in our own lives open the doors for intuitive work, compassion, and acceptance. Inviting emotionally intelligent Muslim wives from the West to create a loving, emotionally deep, spiritual and passionate marriage; to rekindle marriage as an act of worship, a path to being nearer to our Creator, and a gateway to being a wife in Jannah, insha’Allah. She has successfully led workshops dealing with sexual intimacy, communication, and emotional connection, and teaching wives and couples how to practice the art of her concept Fearless Vulnerability in their marriage. 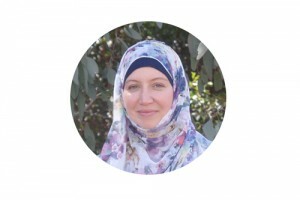 Megan has been coaching Muslims from all over the world since 2008 and through Wives of Jannah works directly with wives and couples in personal coaching and on-site intervention meetings. She has also authored two ebooks both dealing with intimacy, one specifically for women who struggle due to previous sexual trauma in their lives, offering guidance for themselves and their husbands. Working alongside Fouzia Usman and Sh.Yaser Birjas,Megan was an original co-founder for Practimate, a pre-marital training company for single Muslims living in the West. She brings the reality of marital life along with her training to help single Muslims successfully prepare for beginning the marriage process and starting their marital life. Megan is happily married to her husband Zeyad Ramadan, founder of Purify Your Gaze, and is blessed to be a homeschooling mother to four children. They reside in sunny Southern California where they are definitely spoiled in getting to see the beautiful beaches and oceans often! Copyright 2012 by Wives Of Jannah.